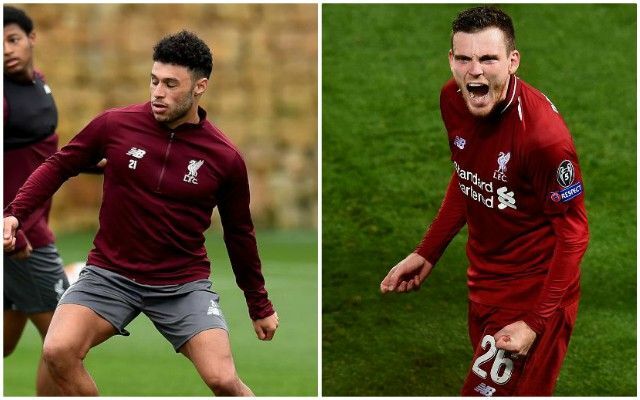 Alex Oxlade-Chamberlain has joked he put himself into Man of the Match contention with his efforts in Tuesday’s warm-weather training session in Marbella. The midfielder stepped up his recovery from a long-term knee injury by working alongside his senior teammates for the first time again. A long and strenuous rehabilitation is now seemingly nearing the end, with the former Arsenal man expected to be available for selection in March. He was recently named in Liverpool’s Champions League squad and could be fit to feature in the Round of 16 second leg away to Bayern Munich on March 13. Rhian Brewster was also involved having been out of action since damaging ankle ligaments in a game for Liverpool’s U23s against Manchester City in January 2018. The 18-year-old has worked closely alongside Oxlade-Chamberlain throughout their respective recoveries, warranting praise from his teammate for his positivity and support. Liverpool were meanwhile without Dejan Lovren after the Croatian was left on Merseyside to nurse a hamstring issue that has been troubling him since the FA Cup defeat to Wolves at the beginning of 2019.